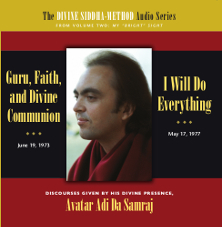 In these two Discourses, Avatar Adi Da beautifully illuminates the nature of the relationship to the Spiritual Master, or Guru. This sacred relationship is the direct means by which the Divine Principle becomes operative in your life. As feeling-attention is magnified toward the Spiritual Master—through the force of attraction, of love, of devotion—the habitual, reactive forces that drive your life begin to lose their force. And the Principle of the Divine becomes the Mover of your life. If you will simply enter into Communion with the Spiritual Master Who is already in the Condition of God-Realization, That Condition will be duplicated in your case.It is the Supreme Instrument.